Dr. Jonathan Schanzer is the author of the new book State of Failure: Yasser Arafat, Mahmoud Abbas and the Unmaking of the Palestinian State. His previous book, Hamas vs. Fatah: The Struggle for Palestine, is still the only book on the market that chronicles the Palestinian civil war. Schanzer got his start in the policy world as a research fellow at the Middle East Forum, a Philadelphia-based think tank. He then worked as a research fellow at the Washington Institute for Near East Policy, where he authored the book Al-Qaeda's Armies: Middle East Affiliate Groups and the Next Generation of Terror. After his stint at Treasury, he was deputy executive director of the Jewish Policy Center and the editor of the JPC's journal, inFOCUS Quarterly. 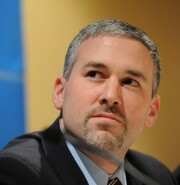 Schanzer holds a BA from Emory University, a masters degree from the Hebrew University of Jerusalem, and a doctorate from Kings College London. He also studied Arabic at the American University in Cairo in 2001. Schanzer publishes widely in the national press, has testified before Congress, and makes frequent appearances on television. He has traveled widely in Iraq, Yemen, Egypt, Morocco, Kuwait, Qatar, Turkey, Jordan, Israel, and the Palestinian Territories. Dr. Schanzer speaks Arabic and Hebrew.